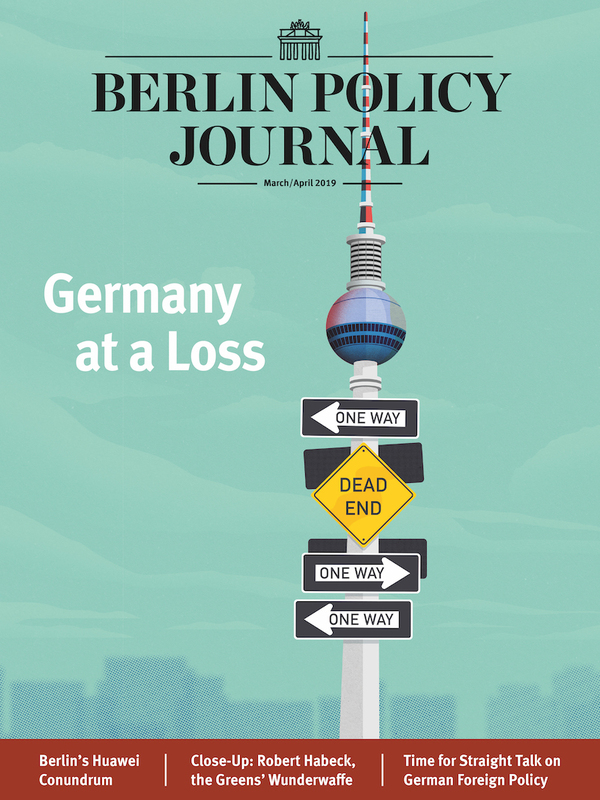 How much co-determination can Germany’s foreign policy take? 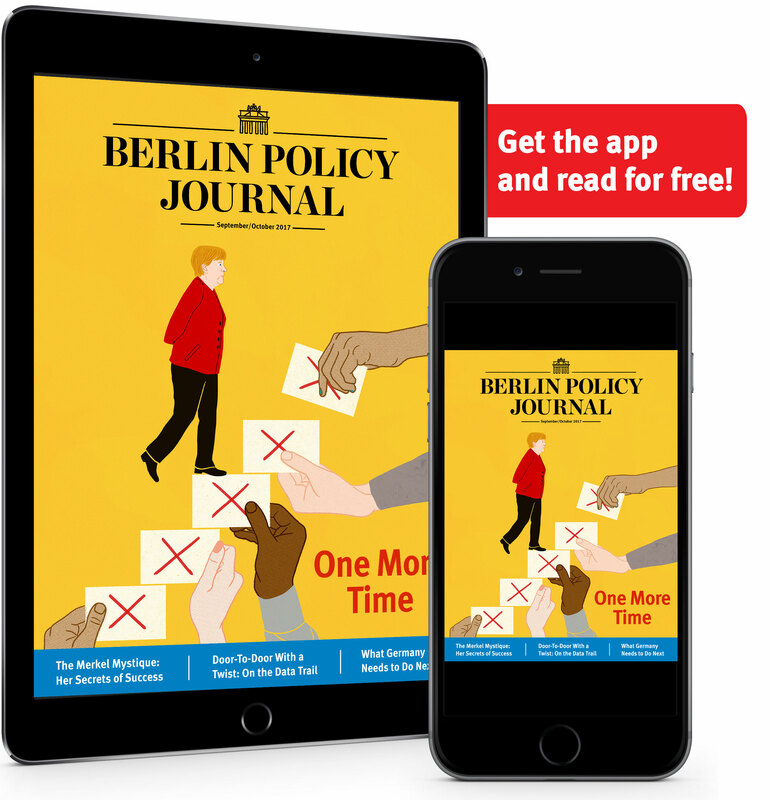 After a year and six Open Situation Rooms, it is clear how much potential lies in an exchange between the foreign policy community and German civil society. But what are the limits of a participative format? In the foyer, organic canapés and rhubarb soda stand at the ready, the door is constantly opening and closing to admit new arrivals, and discussions center on current project pitches and new start-up ideas. It could be a typical midday in Impact Hub Munich if not for a particular special guest: Walter Lindner, the German ambassador to South Africa, is arriving shortly, happy to return to his hometown. He is slightly more skeptical regarding his role as input provider in today’s Open Situation Room: “Not too many colorful little notecards or group bells and whistles, please. Instead let’s just have an open conversation.” Soon the roughly 35 participants, along with Lindner, are in the middle of such an open discussion – though admittedly in small groups, supported by colorful little notecards. This layout is typical for the Open Situation Room format, which is meant to enable the generation of ideas as quickly and creatively as possible. The goal is to utilize the treasure trove of varied experience present in such a heterogeneous group to address pressing foreign policy questions. This time, the question is the cause of global migration. What ideas and new approaches might strengthen the development potential in Africa and combat the causes of migration from the region? Foreign policy has long been considered the sovereign territory of the state and the diplomatic corps; citizen participation was never seen as particularly desirable. Since the Review 2014 process under Foreign Minister Frank-Walter Steinmeier, however, the Federal Foreign Office has tried to correct this impression, opening itself to public input. One of the formats now being tested is the so-called Open Situation Room. The name is meant to be reminiscent of the original situation room of US President John F. Kennedy – with the key difference that the “Open” Situation Room is not held behind closed doors in the White House, but rather in publicly accessible locations with diplomats from the Foreign Office. After the first pilot workshops with the idea’s developers, Nicola Forster and Verena Ringler (this article’s co-author), it was further developed and put into practice by the Mercator Program Center for International Affairs, working alongside Germany’s Foreign Service. The goal of this unconventional approach is to create an additional body to generate discussion and advice on current foreign policy problems. The creators of the Open Situation Rooms are part of a trend: Whether through “Gut leben in Deutschland” (“Living well in Germany”), Re:Publica, or the so-called GovLabs, many policymakers are trying out new structures to enable citizen participation, hierarchy-free discussion, and innovative conversations. In doing so, they are building upon the ideas and methods of “Design Thinking,” a creative process for solving complex problems developed at Stanford University. But how much real substance do such approaches really contribute? The format depends on the inclusion of people from a variety of fields. Each of the 35 people present at the Munich Open Situation Room applied based on the strength of their individual background, and was chosen because they had demonstrated the ability to manage complexity in their own private or professional life and wanted to bring their problem-solving skills to areas outside their usual expertise. Thus post-doctoral physicists meet start-up consultants, and compare insights with child psychologists and bartenders. Does it work? Yes, according to Design Thinking, because complex problems like those in the foreign policy world have to be seen from a variety of angles and with a variety of different approaches in mind. This leads to approaches that an individual would not arrive at. Thus the physicist and the start-up consultant work together in a group on a “MigrAPP”, an app with which they hope to inform migrants about dangers they might face during their journey, offer them chat options in several languages, and put them in touch with officials and information sources. The child psychologist’s group thinks about how youth in Africa can be shown new perspectives and have better opportunities for self-determination; they discuss the creation of a public stage where art and theater can be used as means of expression. These approaches are presented to Ambassador Lindner in several stages of development, and he comments and gives tips on how they could be developed further. At the end of the session, he admits that he’s just as impressed by the variety and creativity of the ideas as he is by the presentation and enthusiasm of the participants. Other Foreign Office representatives to guide Open Situation Room sessions report similar results. In Brussels, Martin Erdmann, the German ambassador to Turkey, asked how the Turkish-German relationship could rebuild trust under current conditions. With Marian Schuegraf, Minister Counsellor at the German embassy in Tehran, participants in an Open Situation Room held with the Deutsche Welle Global Media Forum consider how civil society in Iran could be strengthened. Open Situation Rooms were even used at the German Diplomats Conference at the end of August in Berlin and the Munich Security Conference. But what exactly does the work in an Open Situation Room look like? First, the participants receive a brief prompt from an ambassador or other high-level diplomat, which ends with a specific question. Then they generate as many ideas as possible in small groups, sifting these initial suggestions for the most practical and innovative. Once these are evaluated by the Foreign Office representative, they are expanded: Who would be involved in carrying out the suggestions? Is an idea financially plausible, and which political, social, and economic hurdles will it have to overcome? Thus potential approaches to current problems are worked out in as little time as possible. These sessions also produce reports in which the groups summarize their approaches. These reports are conveyed to the Foreign Office, which passes them along to the units focused on the respective topics. The reports are, of course, available online. Does this mean foreign policy is no longer the sovereign territory of the state? 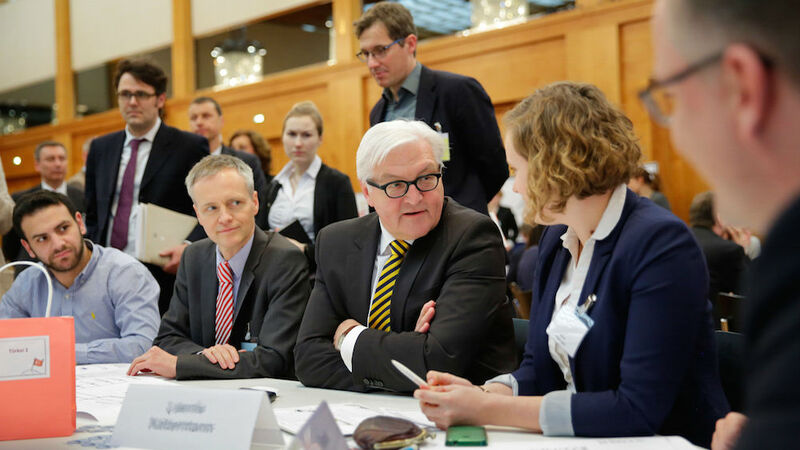 Have Steinmeier and his diplomats made a complete about-face – do they now only want to make foreign policy decisions once they’ve asked the public its opinion? Of course not. Important diplomatic and security decisions will still be handled with the necessary consideration and discretion. Participatory formats like the Open Situation Room can only serve to supplement traditional decision-making apparatuses. Another way to evaluate the contribution of new formats like the Open Situation Room is by comparing them with conventional foreign policy events. The Munich Security Conference and the Global Media Forum, for example, are above all geared towards “front-directed” formats – 90-minute discussions at a podium, usually led by three to five male speakers and a moderator, at the end of which there is time for two or three questions from the public. The Open Situation Rooms are distinctly different from these conferences: Here there is neither podium nor Powerpoint. The participants can – and indeed must – actively get involved and develop their own ideas in small groups. This process of co-design is much more in line with modern models of participation, especially among the younger generation, than the stiff format of the podium discussion. If the German foreign policy community wishes to draw new audiences into a discourse about the country’s international engagement and ensure that different voices are able to express themselves, opportunities for new dialogues and discussion formats cannot be overlooked. Classic panels are less and less in demand; these days, the shift is to open formats and new forms. Of course, this demands a certain boldness from event organizers: the less a discussion is led from the front, the less it can be defined and choreographed in advance, and the stronger guidance it requires from a moderator. In fact, in an Open Situation Room, the role of the moderator must thus be rethought; more than just a “facilitator”, the moderator must be a guide. In the design of formats like the Open Situation Room, particular attention must be paid to the sustainability and work-ability of the proposals suggested so that such co-design structures are taken seriously. The Open Situation Room reports are only a first step to implement the ideas developed in these workshops. The next steps for the coming months are developing the ideas from these sessions and transparently communicating the effects they have on discussion within foreign policy circles. is Project Manager at the Mercator Program Center for International Affairs (MPC) and organizes the Open Situation Rooms. is Director for International Affairs at Stiftung Mercator.